One word that has been a repeated key phrase throughout all of the first season is ぶんしん. I'm going to come out and say right away that this word does not translate at all well into English; there are things that you can say in one language that you simply can't say in another. So what is "bunshin"? Crunchyroll has chosen to translate the word as "avatar," as has whatever dub team is working on the English release of the anime. 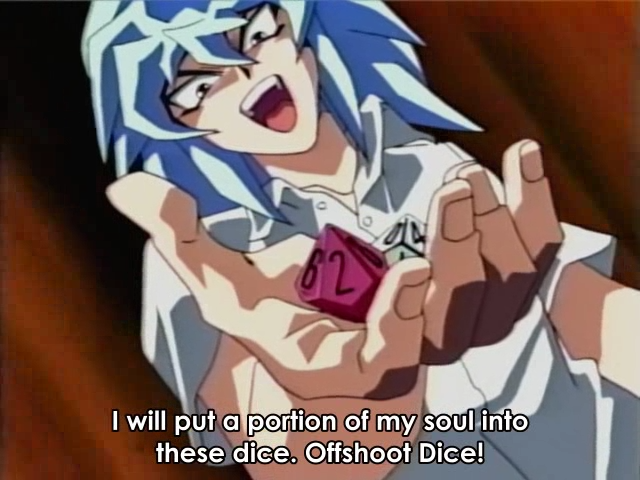 This is probably the most accurate term for the purposes of Vanguard. 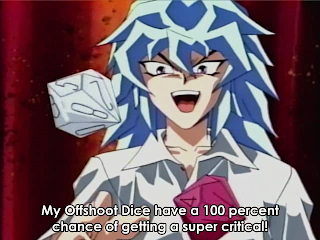 It's in this term that Aichi describes his two Blaster units. Compare with how Kai defines Dragonic Overlord; ほんとのすがた　"honto no sugata" or "true form," which is a distinct and separate term. Though I say that avatar is the most accurate translation, avatar hasn't had its current meaning for very long. "Avatar" as a word has existed for 7500 years, originating in the Hindu religion as a word to speak about the various forms of particular gods. Avatar itself is not an English word, nor does its meaning in English match its meaning in Sanskrit. In Hinduism, avatar is an "appearance, descent" from the heavens, while in English we use this word to mean "incarnation." Much like bunshin and ruach, the original sense of avatar has no English equivalent. The current use of the word avatar was codified in Neal Stephenson's 1992 novel, Snow Crash, in which he used it to describe the digital icons representing people on the internet. It's from this novel that we get the modern term, used to describe images representing user posts on forums and social media websites like tumblr. "Bunshin" has not had a proper translation until just 20 years ago. 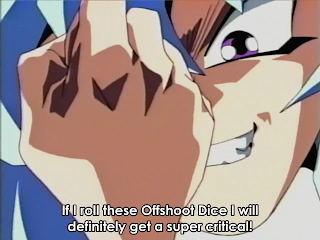 Taking this into account, Vanguard is by far not the first series to use "bunshin." Chronologically, this term has posed trouble for translators of both the 1991 The Legend of Zelda: A Link to the Past and the 1998 Yu-Gi-Oh! TV anime(produced by Toei, separate from the 2000-2004 anime.) "Bunshin" continues to trouble Zelda fans due to how its wildly different meanings affected A Link to the Past's plot. In the aforementioned Zelda game, bunshin was translated as "alter-ego," referring to the primary antagonist, Ganon, and his relationship to a secondary antagonist encountered much earlier in the game, Agahnim. There are two takes on Agahnim--first, that he is truly just a disguised version of Ganon. Second, that he is a separate but linked entity which sought to free Ganon in exchange for power. "Bunshin" at the time had no good translation. Avatar simply didn't mean what it did then, what it does now. "Bunshin" can mean to give live birth, to divide in two, as well as to describe one's own child, and the act and results of reincarnation. Various fanmade Vanguard websites may mention "my second self," which is another translation for "bunshin." 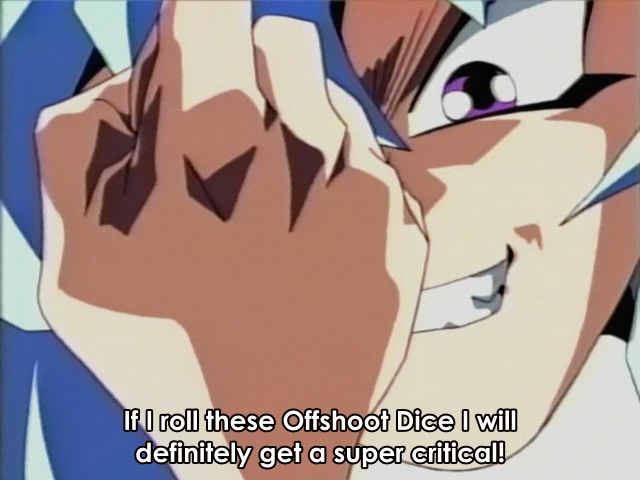 In Vanguard ride 11, Ninja Master M uses a derived term to refer to his body-double technique. Meanwhile, the 1998 Yu-Gi-Oh! has what is perhaps the most cringe-worthy translation of "bunshin." This is probably the worst possible translation of "bunshin" imaginable, but even though avatar did exist in its current meaning in 1998, the term was not popular outside of science fiction circles, so it's certainly an understandable fumble. "Alter-ego" doesn't sound as nice as avatar, nor have the same connotations, but it is adequate. "Bunshin" is quite simply a difficult word, much like trying to explain Übermensch without dipping into German. Avatar really is the best translation, and we should all tip our hats to Crunchy for hitting the mark.